The Market Solution gains traction; but is it too late? Allister Heath has been writing in the Telgraph of the difficulty the "leave" campaign is having in articulating a strong macroeconomic case for Brexit. This, he says, is becoming a major issue, especially for more prosperous, middle-class, centrist and Tory-leaning voters in London and across the country who are craving reassurance that it's safe to vote for Brexit. 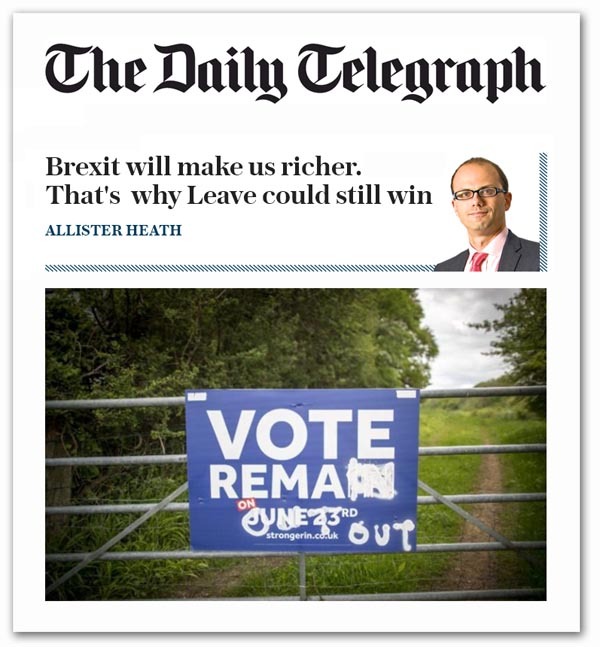 Many Telegraph readers fall into this camp; and we all have friends, relatives and neighbours who are vacillating, wondering whether maybe – just maybe – there may be some truth to the endless supply of screaming, hysterical anti-Brexit reports. The core assumption of the anti-Brexit economists, Heath tells us, is that leaving would erect damaging barriers to trade; the pro-Brexit side must take on and demolish these arguments. The good news, he says, is that it’s quite easy to do so. The Leave campaign's long-term aim is to break away completely from the EU. But there is no doubt that, were we to vote Leave on June 23, the UK would seek to adopt, as an interim solution, a Norwegian-style relationship with the EU which ensures that we remain in the single market, giving us plenty of time to work out new arrangements with the rest of the world. Welcome to Phase One of Flexcit, one might say, and doubly welcome to a journalist who is prepared to write that this "is both the only realistic way we would quit the EU – the only model, that, plausibly, MPs would support as a cross-party compromise deal – and the best possible way for us to do it". Says Heath, the Norwegians would welcome us with open arms, as their own influence would be enhanced, and other EU nations would seek to join us. Such a deal would eliminate most of the costs of leaving, while delivering a hefty dose of benefits as a down payment. As part of the EEA, via the European Free Trade Association, we would remain in the Single Market, complete with its Four Freedoms, while withdrawing from agricultural and fisheries policies, justice and home affairs and the customs union. The City wouldn't lose access and virtually all of the anti-Brexit scare stories would be neutralised, which is presumably why that option was mysteriously absent from the Treasury's ludicrous analysis of the short-term impact of Brexit. Furthermore, this option would make us more, rather than less, influential. We have only a small share of the votes in Brussels and can thus easily be outvoted. But Norway, which has technically no votes, has regularly moulded key rules, including the Consumer Rights Directive. The real reason why we – as a large and powerful economy – would have greater influence is that Brussels is increasingly not the place where big decisions take place. Rules are increasingly negotiated under the auspices of global bodies: automotive norms are determined by the World Forum for the Harmonisation of Vehicle Regulations; food standards are determined by Codex Alimentarius; shipping rules are under the aegis of the International Maritime Organisation; and the crucial new banking regulations are being determined by the Financial Stability Board. These regulations are then passed down, with the odd gold-plating, by the EU. These global bodies proceed by consensus, not qualified majority; we are currently represented by the EU at these meetings. A Brexit would allow us to have a seat at these top tables, and thus to disintermediate Brussels. Thus, concludes Heath, the economic case for Brexit is remarkably strong. If Brexiteers want to reassure floating middle class voters, it will need to be made again and again, loudly and clearly, over the next four weeks. That is the bad news. The bones of this scenario have been around since April 2014 – a full two years – with 70,000 people having downloaded the full version. Now, with four weeks to go, we are getting an outline of the first of the six phases in a national newspaper – without the plan being named, of course. We already know that this is "the only realistic way we would quit the EU" and "the best possible way for us to do it", but it is good to have that confirmation from Mr Heath. But we knew that a year ago when we sent a copy to Dominic Cummings, and we knew that when we later gave a copy to Arron Banks. Both were in a position to promote "the best possible way" of leaving the EU. Even earlier, back in April 2014, Nigel Lawson who chaired the IEA "Brexit Prize" judging panel could have made the difference. But he didn't either. So, with four weeks to go, there are hundreds of thousands of "middle-class, centrist and Tory-leaning voters in London and across the country who are craving reassurance that it's safe to vote for Brexit" – exactly the target group that we need to win over in order to succeed in this referendum. And there is insufficient time to get the message to them. For want of that essential "reassurance", God knows how many votes we will lose. And that will make the difference.